Unless you’ve been living under a rock you would have noticed the rise of a breed of woodworkers and creators that seem to be taking the world by storm. Their YouTube channels serve as a window into their lives and workshops and you only need to look at their subscriber count to realise that we love what they are doing. It wasn’t too long ago when you could count the number of YouTube woodworkers on one hand, but in recent years there has been an explosion of talent and everyone is bringing something unique to the table. You don’t need $100,000 of tools and a workshop bigger than your house to get involved. As much as we love to look at dream workshops and long for big power tools, we want to be able to create things for ourselves and family and friends and be inspired by people who can still do this without a huge budget and workshop. Now don’t get me wrong some of these guys have some impressive workshops, but a lot of them started on their woodworking journeys with very modest set ups. So today, I wanted to look at some of the most popular woodworkers on YouTube and what table saw they have chosen to be at the heart of their workshop. 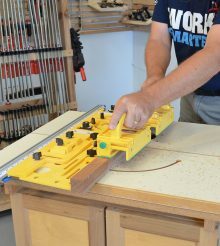 It was great to see quite a bit of variety of table saw choice and I think it goes to show that you need to find the right table saw for your space, budget and style of woodworking. Matthias has a huge following on his YouTube channel, and you don’t need to see many videos to understand why. His videos are very much a lesson in woodworking and engineering. 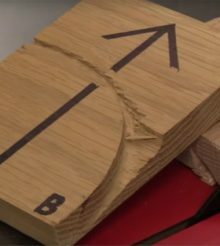 The table saw that Matthias uses is a Delta Hybrid, model 36-655C. He managed to get a great deal on this saw from Home Depot and in true Matthias Wandel style, he felt that it needed a few additions. As well as sorting out a problem with the arbor flange and spending time fixing the saws alignment. He increased the max depth of cut by altering the max depth of cut stop. He also made his own zero clearance throat plate as well as well as increasing both the depth and width of the table. Matthias also made his own router table extension for the saw. Mathias makes a great point that it doesn’t matter what saw you buy, you should expect to spend some time setting it up and refining it to get it running perfectly. Bob Clagett is the face of the iliketomakestuff YouTube channel. Compared to some of the others, he’s a relative newcomer to the YouTube scene, but his popularity is growing at a phenomenal rate. One of the big appeals of Bob’s channel is that he doesn’t just concentrate on woodwork. It could be workwork, metalwork, electronics, model making, I could go on. One thing is for sure Bob makes some very cool stuff. So what table saw does Bob use in his shop? Well up until recently you would have found a modest Craftsman 21829 which is a good portable style table saw. Now Bob is the proud owner of a SawStop Professional Cabinet Saw, like this. They really are great table saws and I wont go into their brilliant flesh detecting technology here. All you have to do is google them to see how good they are. Even if you take away the safety aspects of this saw, you are still left with a very good, very well made hybrid table saw. Prices for this SawStop start at about $2,200 and for that you get 1.75 HP motor and a 30″ fence. To get a better idea of the options visit the SawStop website. Marc is one of the original YouTube Woodworking bloggers and is still going very strong today with a huge following of fans and subscribers. Marc has a very nice sized workshop with a lot of very cool tools. One tool that gets a lot of use is Marc’s Powermatic cabinet saw. The saw that he uses has a few custom extras from woodwerks.com but is ultimately the Powermatic 1792002K PM2000. It’s a heavy duty cabinet saw that has a 3HP motor, 240V single phase. John Heisz is an incredibly talented woodworker who shares some awesome project videos on his YouTube channel. John did it a bit differently when he came to sourcing his table saw. Rather than head to the store and buy a brand new saw from his shop. He set out with a plan to spend as little as he could on finding an old saw that needed restoring and breathing new life into it. John managed to find for sale two saws near him. A 1994 Delta and a 1987 BusyBee. He only paid $200 for both, and harvested parts from them to make one saw. It really goes to show that you don’t need to spend a lot of money to have brilliant tools, but you must be prepared to spend time making them right. 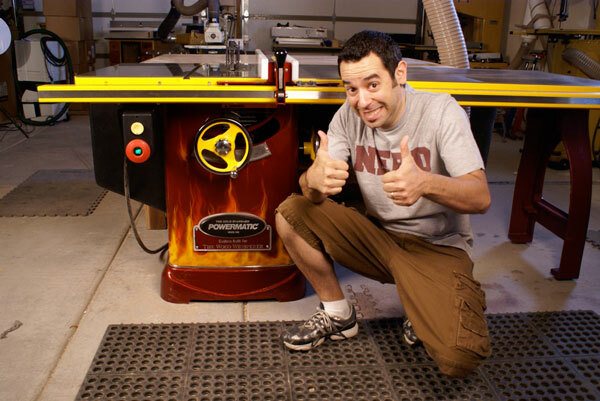 To find out more about John’s table saw build, you can read more on his website. If you have searched for anything table saw related on YouTube, then the chances are that you have stumbled across Izzy Swan. Often referred to as “The King of Jigs” Izzy has a truly amazing YouTube channel. Some of the table saw jigs that Izzy has conceived and built are Brilliant! Terrifyingly brilliant!! (How to carve a bowling ball on a table saw). And the table saw that Izzy uses in his garage workshop is the Delta 13 Amp 10 Inch Contractor Table Saw from Lowes. It’s a great contractor style table saw. With its mobile base it can easily be moved around the workshop. Jay Bates from Jays Custom Creations has a very popular woodworking YouTube channel. There are lots of great workshop projects as well as loads of other cool woodworking projects. I love Jay’s workshop everything seems organized and looks spacious. And being situated in a two car garage, he can open the big garage door and let in a lot of natural light into the shop. Because it a garage everything has been designed with portability in mind and everything is on casters. And the same goes for the table saw. Jay has chosen the SawStop PCS with the 52″ Fence. And because portability is a priority he has also opted for industrial mobile base making it easy to move such a big saw around the workshop. If you want to see more of Jay’s workshop you can head over to his website and see his shop tour. April has a great woodworking YouTube channel that is going from strength to strength and is building a very impressive following. April’s channel covers a wide range of projects, from projects for the workshop to really cool things around the house. She also has a very well laid out website if you need more information on the YouTube videos. Like a lot of the other YouTubers here, this wasn’t April’s full time job, but the success of her channel has allowed her to quit her job and concentrate on this channel full time. April is another YouTuber who has opted for the brilliant SawStop PCS to go in her decent sized 1600 square foot workshop. You may also know him as “The Drunken Woodworker”. David has been making incredibly entertaining YouTube videos since early 2013, Which is not very long in comparison to other woodworking YouTubers. But his entertaining and down to earth approach means to his project videos are a pleasure to watch. David has a good size workshop and he accumulated a nice collection of power and hand tools. So when it comes to the table saw, we have another vote for the brilliant SawStop PCS. 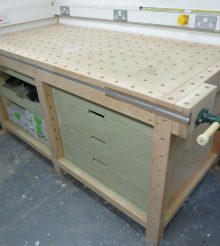 David recently posted an update on this saw, where he upgraded his mdf outfeed table with probably one of the best looking outfeed tables I’ve ever seen. You can can check out his video and see the plans here. So there you have it, this is just a small selection of popular youtube woodworkers. I plan on doing a volume 2, as I know I have barely scratched the surface here. If there is anyone you would like to see featured, please leave me a comment below. Ummm, His name is John Heisz, not Heinz !!! Sheesh. I know, I know, auto-correct, right? The saws and their many enhancements look great. I would be happy with any of them but bought a Delta 36-L336 because the tilt control is up front where it is easier for my arthritic hands to turn.